If you’re travelling some distance to visit the museum contact us on (02) 6036 3464 or internet info@australianpottery.net.au to ensure we are open. Adults $5 per head, Children under 16 years of age $4 per head. Family (2 Adults, 2 Children) $15. We can cater for large and small groups who book ahead, with homemade morning tea, afternoon tea or supper, along with an introduction talk and a guided tour for $12 per head. We also have a small number of selected Australian pottery pieces for sale. We look forward to seeing you soon at the Museum. 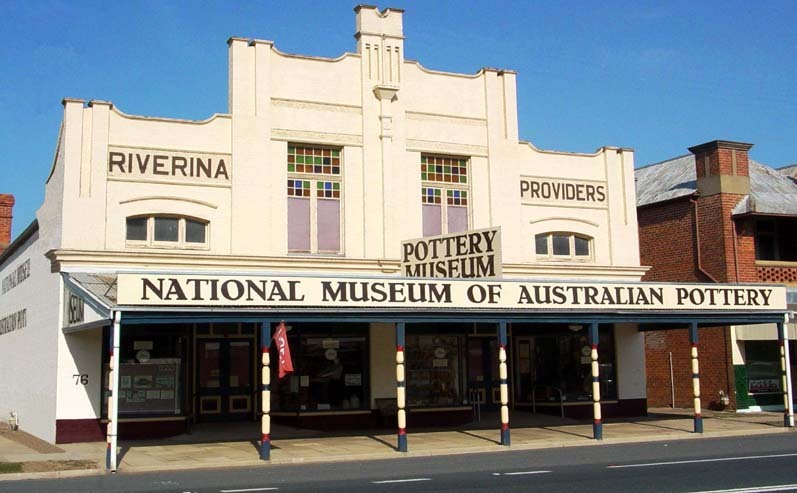 The National Museum of Australian Pottery is the only Museum dedicated to 19th and early 20th century Australian pottery and is the culmination of many years of collecting and research throughout Australia. On display are close to 1,900 pieces of domestic pottery from 126 Australian pottery companies established between European settlement and the end of World War I, (1918). Visitors have a unique opportunity to further their knowledge and appreciation of our early Australian pottery heritage. So come and spend some quality time at Holbrook in the National Museum of Australian Pottery with Geoff and Kerrie Ford. This magnificent Majolica glazed cheese cover and plate decorated with cows and a platted rope pattern was made at the Lithgow Pottery by William Holford c. 1882. The Friends of NMAP Inc. get together at the Museum four times a year. At the Friends meeting in February, one of the members brought along this fabulous collection of 5 Majolica glazed bread plates made at the Lithgow Pottery in the 1880s, 4 of which are impressed with Lithgow stamps. If you would like to become a member you can find further information and a membership form in the ‘NMAP FRIENDS’ section.